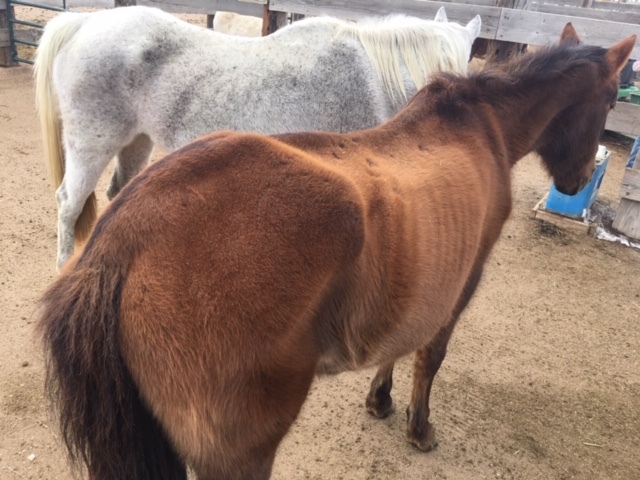 On Saturday, January 26, 2019, deputies with the El Paso County Sheriff’s Office Rural Enforcement and Outreach Unit (REO) Unit responded to an address in the 13400 block Paint Mine Road in reference to an animal neglect case involving two emaciated horses on the property. A veterinarian was contacted and confirmed that both horses were neglected based on the lack of feed and dental care. The horses were seized and are being held in an American Society for the Prevention of Cruelty to Animals (ASPCA) approved boarding facility. The caretaker of the property was served and released on two counts of animal cruelty. Attached are photos of the seized horses.